Net Weight: Packet (50 seeds)1oz (1400 seeds)(+$7)1/4lb (5600 seeds)(+$25)1lb (22000 seeds) (+$58) This item is currently out of stock! This colorful mixture of earthen shades of large 4-8 inch blossoms on tall plants make ideal cut flowers as well as borders in the garden. Colors are a mixture or red, brown, mahogany, orange, and yellow. 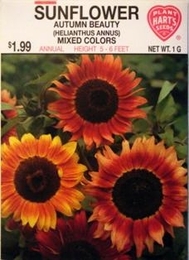 Sunflowers are among the easiest kinds to grow, ideal for children.